Standard - £16.99 Only 5 left! Look...we're your friends, so we're not trying to judge you here or make you feel bad...but sometimes friends gotta give each other the hard truths, and sister, you've got some coming to you right now: You gotta do something about those hands! 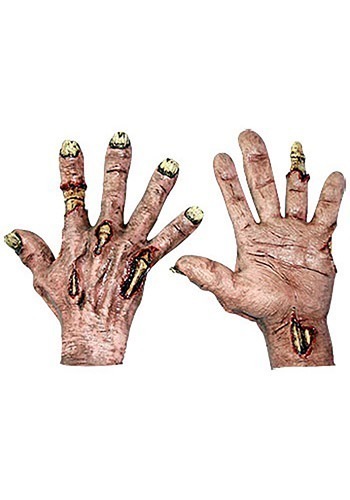 We read once that Goldie Hawn told her daughter Kate Hudson that hands were the easiest way to really tell a woman's age, and we're gonna be straight with you...no matter how much contouring or highlighting you do to your face, one glance at those hands and anyone can tell that you're part of the undead. And yeah, okay, you've got a great personality, and even with some of the flesh hanging off of it, your face is as pretty as it was 50 years ago...but those Zombie Flesh Hands are horrifying, and frankly, they take away from everything else you might have to offer. We know that's hard to hear, but we're telling you because we love you. No, that's okay...no need to touch us! We don't need a hug...just, go get a manicure or something. Maybe invest in a line of cute gloves. Just do something to cover those open bloody wounds and exposed bones up, alright? Great...you're the best, boo. Kiss kiss!